U.S. stocks ended a weak month on a mixed note Wednesday as the markets reopened following a two-day closure due to Hurricane Sandy. The Dow Jones industrial average lost nearly 0.1%, while the S&P 500 ended flat. The Nasdaq lost 0.4%. For the month, the Dow fell 2.4%, the S&P 500 sank 1.9%, and the Nasdaq logged a 4.5% decline. Many expected trading volume to spike Wednesday after Wall Street spent two unscheduled days in the dark. But the number of shares trading hands was held in check as many investors were still without power and transportation remained limited in New York City. "There is some pent-up demand to trade after being closed for two days," said Art Hogan, managing director at Lazard Capital Markets. "But you have to balance that with the fact that many folks are still not able to get back to work." The two-day trading halt was the longest weather-related closure of the NYSE since a massive blizzard struck New York in 1888. In a symbolic gesture, New York City mayor Michael Bloomberg rang the opening bell on Wednesday. 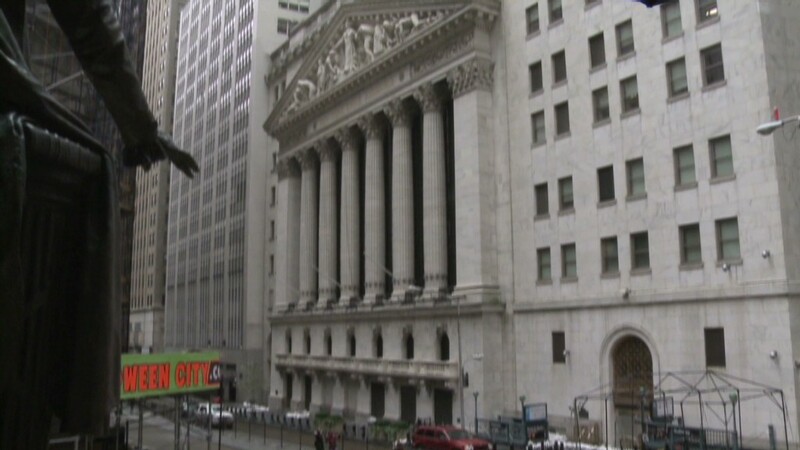 With the city's financial district without power, the stock exchange was running on gas-powered generators. The exchange was still working out some kinks, but it appeared to be functioning properly, said Lawrence Leibowitz, chief operating officer of the NYSE, in an interview with CNN. "I think it's a symbol that makes everybody feel better -- that says we're back on our feet, we're open for business," Leibowitz said from the floor of the exchange. Still, traders were reluctant to place big bets on the first day after such an unusual event. In addition, many investors are taking a cautious approach ahead of next week's presidential election and the economic threat posed by the looming fiscal cliff. "A day like today, you just sit on your hands," said David Rovelli, managing director of U.S. equity trading at Canaccord Genuity. Wednesday marks the end of the month and is the final day of the fiscal year for many institutional investors. It's a day when many mutual fund managers will try to offset their capital gains with their losses to minimize distributions paid out to shareholders. However, some managers may have done their so-called "window dressing" last week in anticipation of the storm. "This was a pretty well-advertised storm," said Hogan. "I think some of that work of closing the books might have been done last week." Meanwhile, investors focused on companies that could benefit from the clean-up effort. Home improvement retailer Home Depot (HD) rose 2% and Lowe's (LOW) gained 3%. 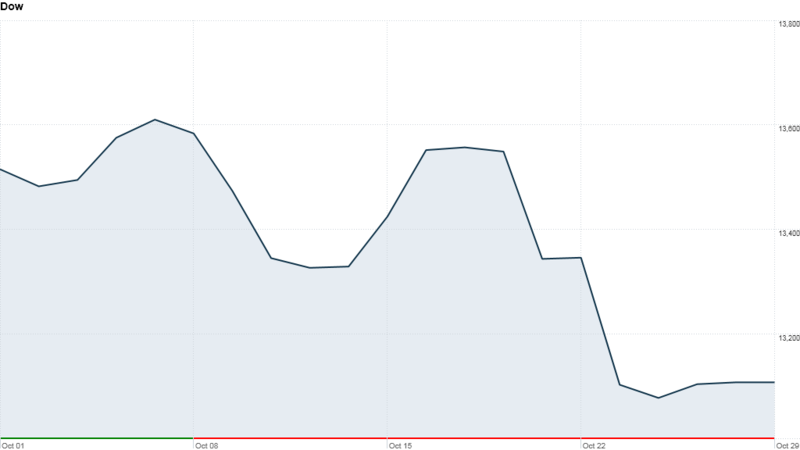 Shares of Great Lakes Dredge & Dock (GLDD) gained, along with Beacon Roofing (BECN) and Owens Corning (OC), which make insulation and building materials. Shares of Generac (GNRC), a generator maker, jumped 21% after the company boosted its earnings and revenue forecast for the year, as a result of "increased demand for home standby and portable generators" in the aftermath of Hurricane Sandy. Insurance stocks, such as AIG (AIG), Allstate (ALL), and Hartford Financial (HIG) were little changed. Knight Capital (KCG) stopped taking new trading orders Wednesday afternoon as it struggled with "power issues" and requested its clients re-route all stock orders to other trading firms, according to two traders who received a memo from the firm. Shares of the New Jersey-based broker-dealer fell 3%. Companies: Shares of Netflix (NFLX) surged 15% after activist investor Carl Icahn disclosed a nearly 10% stake in the online TV and movie rental company. In a regulatory filing, Icahn said Netflix may hold "significant strategic value" for larger competitors. Shares of Facebook (FB) were down about 4% as many Facebook employees finally got a chance to sell their shares for the first time, after a lock-up on their so called "restricted stock units" expired. A total of 234 million Facebook shares will be newly eligible for sale. Apple (AAPL) shares fell below $600 after the tech darling said Monday that two top executives were leaving the company. The storm prompted many companies to postpone their quarterly earnings reports. But others, including Ford (F), Archer Daniels Midland (ADM) and TD Ameritrade Holding Corp (AMTD) still issued their results. Ford reported earnings that remained steady from a year earlier as strong results at home helped balance out the soaring losses in Europe. ADM posted earnings that topped expectations but fell 60% from a year ago. Early Wednesday, GM (GM) reported lower quarterly earnings of $1.8 billion on increased losses in Europe. But results topped forecasts, pushing shares of the car maker up almost 5%. Shares of Take-Two Interactive (TTWO) rose 4% after the company reported revenue that topped forecasts, but the software firm cut its earnings and sales outlook for the current quarter. PVH Corp. (PVH) shares surged 18% after the owner of the Calvin Klein and Tommy Hilfiger brands agreed to buy Warnaco Group (WRC) in a deal worth $2.9 billion. Warnaco had licensed the Calvin Klein jeans brand from PVH, so the deal brings all Calvin Klein-branded apparel under one company's umbrella. Shares of Warnaco jumped 38%. The Walt Disney Company (DIS) agreed to buy Lucasfilm late Tuesday in a stock-and-cash deal valued at $4 billion, gaining control of the blockbuster Star Wars franchise. Economy: Investors are also gearing up for the crucial October jobs report, which is the final reading on the health of the job market before the presidential election next week. While there had been some concern about the report being delayed, the Bureau of Labor Statistics says the report will come out on Friday morning as scheduled. World Markets: European stocks closed lower. Britain's FTSE 100 fell 1.1%, the DAX in Germany sank 0.3% and France's CAC 40 slid 0.9%. Unemployment in the eurozone rose in September to a record high of 11.6%, the European Commission's Eurostat statistics agency reported Wednesday. Asian markets closed higher. The Shanghai Composite added 0.3%, while the Hang Seng in Hong Kong and Japan's Nikkei increased 1%. Currencies and commodities: The dollar fell against the euro and the British pound but gained ground versus the Japanese yen. Oil for December delivery rose 50 cents to $86.18 a barrel. Gold futures for December delivery gained $7 to settle at $1,719.10 an ounce. Bonds: The price on the benchmark 10-year U.S. Treasury rose, pushing the yield down to 1.70%.